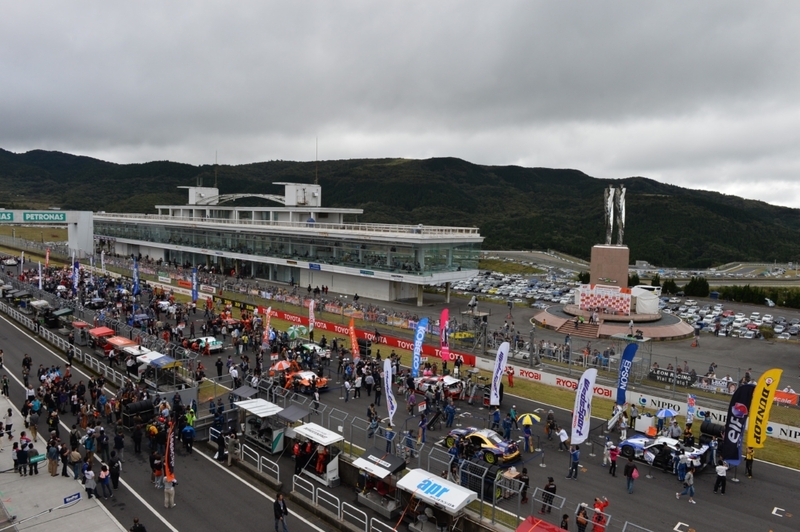 The SUPER GT IN KYUSHU 300km race, Round 7 of the AUTOBACS SUPER GT series, took place on Oct. 6 at the AUTOPOLIS (lap = 4.674 km x 65 laps) in Oita Pref. With intermittent rain falling during the race resulting in frequent changes in the places of the competitors, the GT500 race was won by the No. 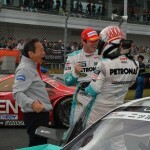 36 PETRONAS TOM'S SC430 (driven by Kazuki Nakajima and James Rossiter) coming from behind to claim the win. 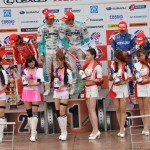 The GT300 class winner for the second round in a row was the No. 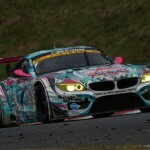 4 GSR HATSUNEMIKU BMW driven by Nobuteru Taniguchi and Tatsuya Kataoka. 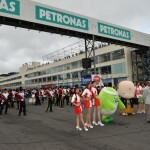 Compared to the morning qualifying held under continuing cloudy skies with an air temperature of 22°C. 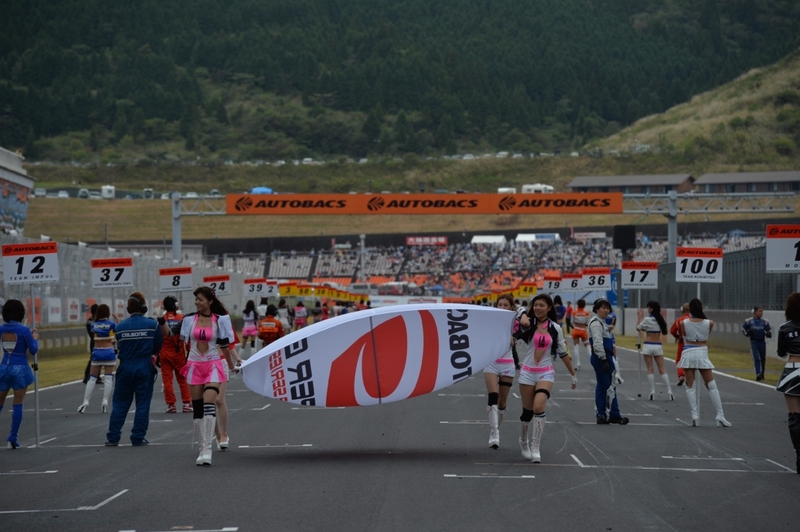 and the track surface temperature of 24°C, it was slightly warmer at 2:00 in the afternoon when the SUPER GT IN KYUSHU 300km race started. 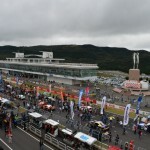 Before the actual start, a warm-up time lengthen to 15 minutes saw all the GT500 team drivers hurrying to get a feeling for their machine performance before finally lining up on the starting grid with the pole-position No. 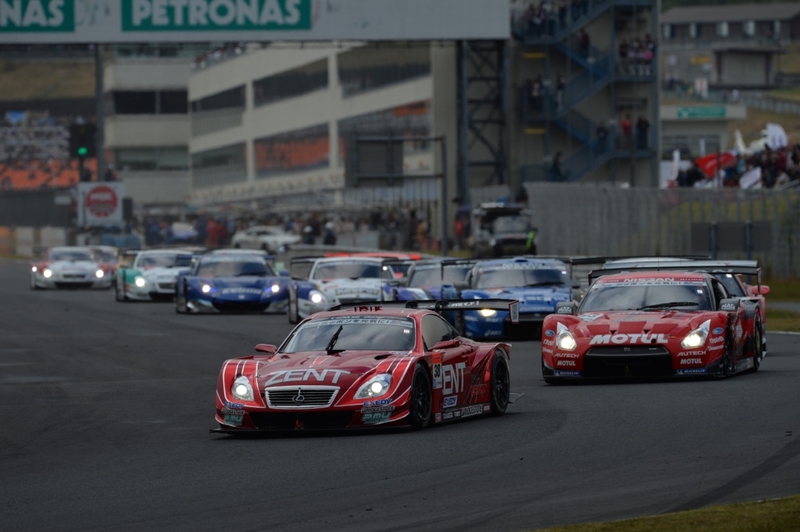 38 ZENT CERUMO SC430 (Kohei Hirate) at the front. After one formation lap the 65-lap race was off to a roaring start at 2:04. It was a clean start with no trouble or upsets, as the No.38 ZENT CERUMO SC430 raced ahead into the lead and built up a significant lead of 1.6 seconds by the end of the first lap. No. 38 was followed by the No.23 MOTUL AUTECH GT-R (Ronnie Quintarelli), No.18 Weider Modulo HSV-010 (Naoki Yamamoto), No.1 REITO MOLA GT-R (Satoshi Motoyama), No.12 CALSONIC IMPUL GT-R (Tsugio Matsuda) and the No.100 RAYBRIG HSV-010 (Takuya Izawa), all in their grid order, while the No.8 ARTA HSV-010 (Ralph Firman) succeeded in moving up into 7th position. The competition quickly became heated however in the early going, and by the first turn of lap three the No.18 Weider Modulo HSV-010 caught and passed the No.1 REITO MOLA GT-R to move into 3rd position. Behind them, the No.8 ARTA HSV-010 was passed by the No.37 KeePer TOM'S SC430 (Andrea Caldarelli) and the No.36 PETRONAS TOM'S SC430 (James Rossiter) on the fifth lap, and on the next lap the No.17 KEIHIN HSV-010 (Toshihiro Kaneishi) challenged the No.37 KeePer TOM'S SC430 and was soon joined by the No.36 PETRONAS TOM'S SC430 and the No.24 D'station ADVAN GT-R (Hironobu Yasuda) in a close-fought mid-pack battle. 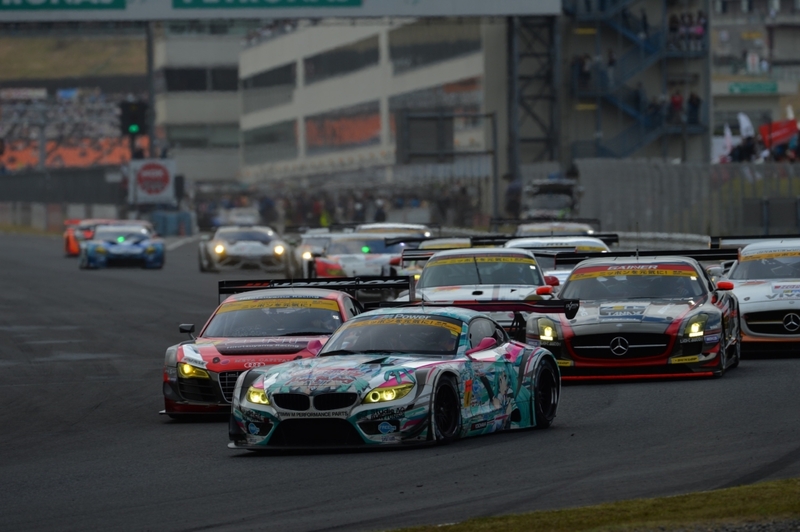 By lap six the GT500 class leaders were already coming up on GT300 class back markers. At this point the No.38 ZENT CERUMO SC430 seemed to lose some of its margin of lead, while the three GT-R machines behind, the No.23 MOTUL AUTECH GT-R, No.1 REITO MOLA GT-R and No.12 CALSONIC IMPUL GT-R fought a battle for 2nd position. This allowed No. 38 to open up a lead again and stretch it to 11 seconds by the 10th lap. As Hirate ran in the lead, his four top rivals from the No.12 CALSONIC IMPUL GT-R in 2nd place to the No.36 PETRONAS TOM'S SC430 in 5th place continued a nip and tuck running battle, allowing Hirate to watch and maintain a lead of around 11 seconds lap after lap. At some point after the 25th lap light rain began to fall, and soon the lead group began making their routine pit stops, beginning on the 29th lap with the No.23 MOTUL AUTECH GT-R and followed on the 30th lap by the No.12 CALSONIC IMPUL GT-R, No.1 REITO MOLA GT-R, No.36 PETRONAS TOM'S SC430, No.18 Weider Modulo HSV-010 and others. 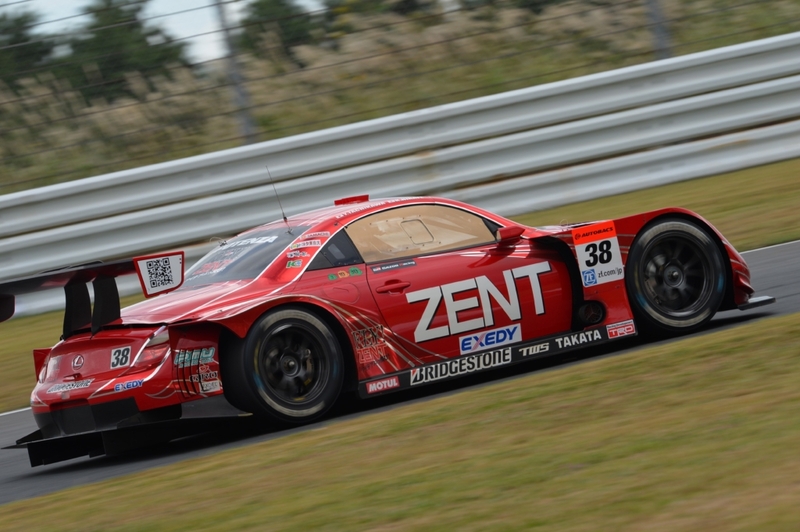 However, the No.38 ZENT CERUMO SC430 waited until the midpoint in the race, the 33rd lap, before making its pit stop and turning the wheel over to Tachikawa for the remainder of the race. When the No.32 Epson HSV-010 (Daisuke Nakajima) finally made its late pit stop on lap 35 and the No.38 ZENT CERUMO SC430 returned to the lead position on lap 36, it had a 17-sec. lead over the No.1 REITO MOLA GT-R (Yuhi Sekiguchi) in 2nd place, flowed by the No.18 Weider Modulo HSV-010 (Frederic Makowiecki), No.23 MOTUL AUTECH GT-R (Masataka Yanagida) and the No.36 PETRONAS TOM'S SC430 (Kazuki Nakajima), while the No.24 D'station ADVAN GT-R (Michael Krumm) occupied 6th position. 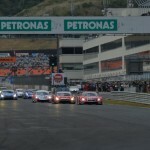 Among this lead group, the No.23 MOTUL AUTECH GT-R caught and passed the No.18 Weider Modulo HSV-010 on the first corner of the 38th lap, after which No.18 was also passed by the No.36 PETRONAS TOM'S SC430 to fall to 5th position. Then, on lap 44 the No.36 PETRONAS TOM'S SC430 passed the No.23 MOTUL AUTECH GT-R to move into 3rd position, and at the same point in the race the No.23 MOTUL AUTECH GT-R was issued a drive-through penalty for what was judged to be a violation in its pit work. After returning to the pit to execute its penalty on lap 46, the No.23 MOTUL AUTECH GT-R had dropped to 7th position. 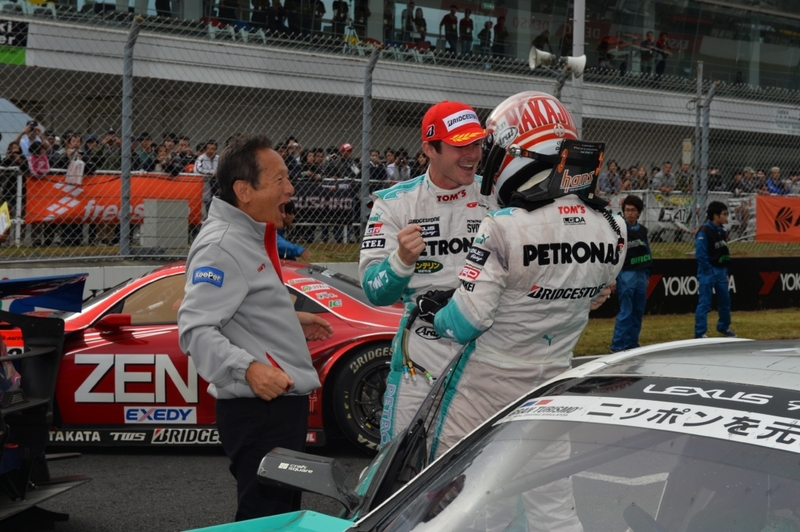 Continuing its move to the front at a high pace, the No.36 PETRONAS TOM'S SC430 caught the No.1 REITO MOLA GT-R on lap 48 as it slowed behind back markers and was able to get past and move into 2nd position for the first time in the race. 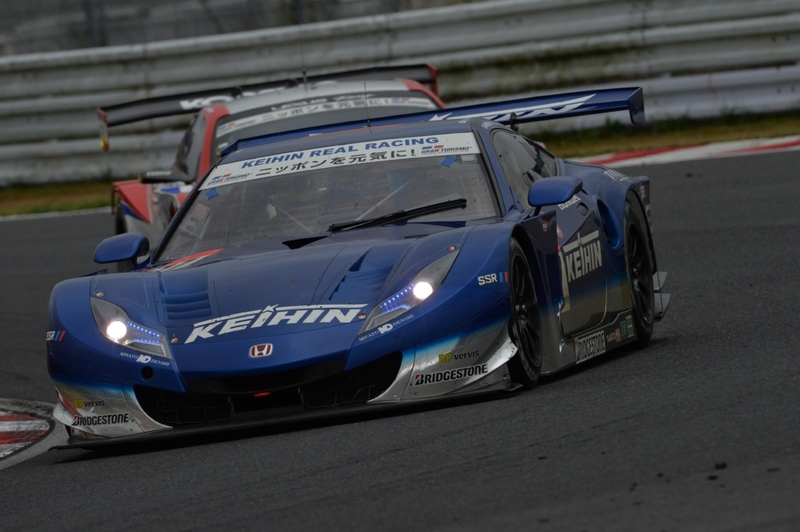 Also, the No.17 KEIHIN HSV-010 (Koudai Tsukakoshi), having moved up steadily, was able to catch and pass both the No.18 Weider Modulo HSV-010 and the No.1 REITO MOLA GT-R on lap 50 to move into 3rd position. 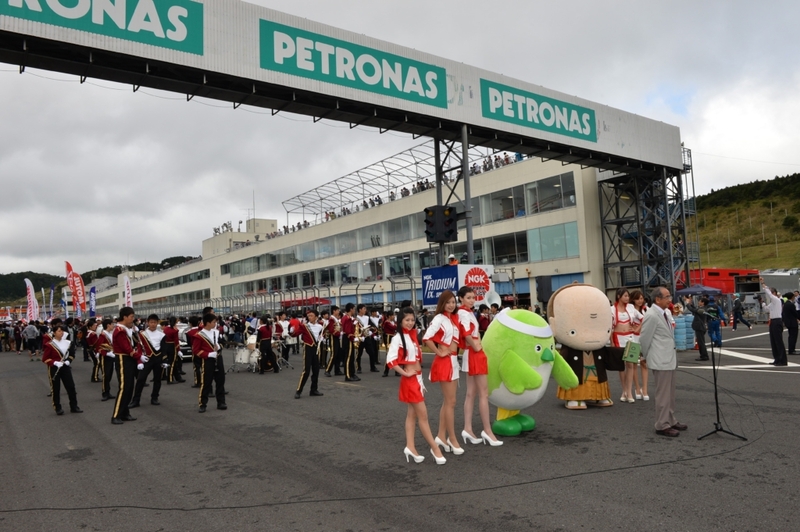 At this point in the race the No.36 PETRONAS TOM'S SC430 and No.17 KEIHIN HSV-010 in 2d and 3rd positions respectively were running consistently at a pace of 1'43 per lap and were beginning to slowly shrink what had been an 11-sec. margin of lead by the No.38 ZENT CERUMO SC430. Meanwhile, the No.38 ZENT CERUMO SC430 that had seemed to be well on its way to a runaway victory had picked up enough tire shredding to slow its pace in the latter stages of the race, and despite Tachikawa's best attempts his margin of lead had vanished. By the 62nd lap, the gap separating the top three cars was down to just one second. 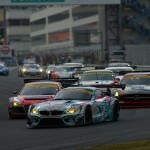 In the battle to hold off his pursuers, Tachikawa was force to avoid a back marker trying to return to the race after an accident at the first hairpin and on the second hairpin, Kazuki Nakajima (No.36) managed to slip in on his in side and take the lead. After having fought all the way up from a 10th place position on the starting grid, the No.36 PETRONAS TOM'S SC430 went on to secure an amazing come-from-behind victory. 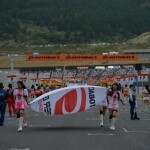 It was the team's second win of the season following the one in Round 2 at Fuji and it moved them up to second place in the season standings. 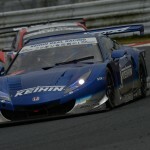 Although the No.38 ZENT CERUMO SC430 had given up the victory in the last laps, Tachikawa was able to hold off the final charge by No.17 KEIHIN HSV-010 and take 2nd place and thus secure the lead in the standings by a 4-point margin with one round remaining in the series. 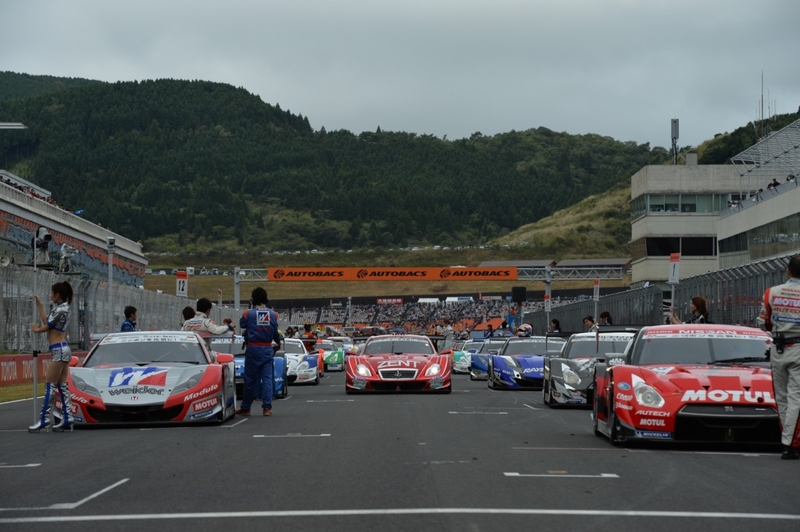 Filling out the 4th to 6th places in the race came the No.1 REITO MOLA GT-R, No.18 Weider Modulo HSV-010 and the No.24 D'station ADVAN GT-R respectively. The No.12 CALSONIC IMPUL GT-R and No.23 MOTUL AUTECH GT-R that had stood in 2nd and 3rd places respectively in the standings lost ground in the point race as No. 12 retired from the race pointless and No. 23 finished 8th. 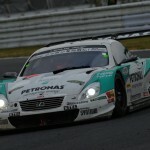 This puts the GT-R teams in a tough position for the title race in the last round. 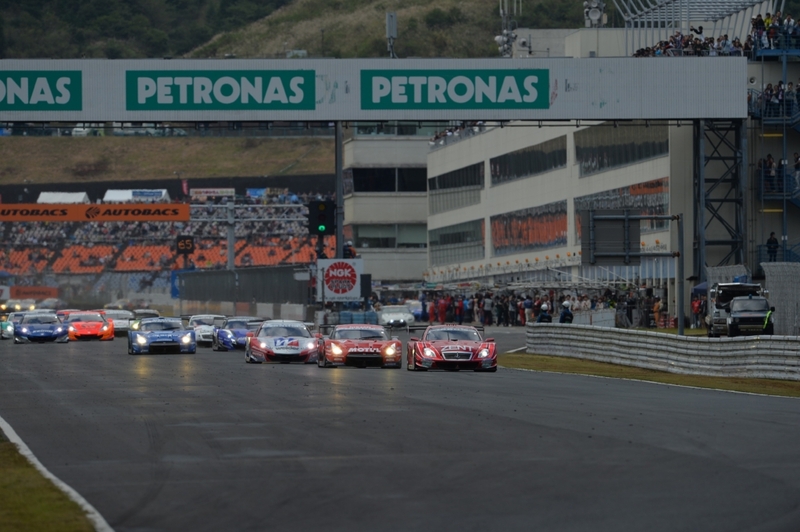 The first upset of the GT300 class race happened before the start. The No. 61 SUBARU BRZ R&D SPORT that had qualified 4th in the morning was forced to make a pit start in the race. During the qualifying it had created a flat spot on tires on the very set chosen for the race start. As a result, the team had to choose a pit start. This choice enabled them to change the bad tires after the start before entering the race. The No. 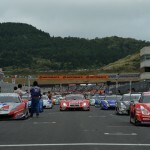 0 ENDLESS TAISAN PORSCHE also made a pit start for the same reason. As the race started, the pole-sitting No. 3 S Road NDDP GT-R (Daiki Sasaki) was able to hold the lead position. The 2nd-place qualifying No. 48 DIJON Racing IS GT-R (Hiroshi Takamori) gradually fell back in position after the start. Instead, it was the No. 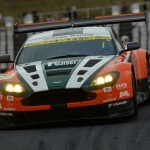 50 Exe Aston Martin (Hideto Yasuoka) that gave chase to the S Road NDDP GT-R. After having allowed the S Road NDDP GT-R to get out to a 3-second lead at one point, the Exe Aston Martin close the gad and was on No. 3's tail by lap five, and on lap seven it succeeded in passing the S Road NDDP GT-R. Once in the lead, the Exe Aston Martin quickly opened up a growing margin over the S Road NDDP GT-R, and by the 20th lap it was running away with a 13-sec. lead. Meanwhile, the No. 4 GSR HATSUNEMIKU BMW (Tatsuya Kataoka) was closing in on the tail of the S Road NDDP GT-R. A severe battle developed between these two machines until the GSR HATSUNEMIKU BMW made its routine pit stop on lap 26. Just past the halfway point in the race on lap 37, the S Road NDDP GT-R (Kazuki Hoshino) began chasing the GSR HATSUNEMIKU BMW that had gained 2nd position with faster pit work. Soon, however, the S Road NDDP GT-R's pace slowed with electrical system trouble and Hoshino had to bring it to a stop off the track. The leading Exe Aston Martin waited as long as possible before making its pit stop on lap 38. Before the pit stop it had a lead of 1 min. 14 sec. 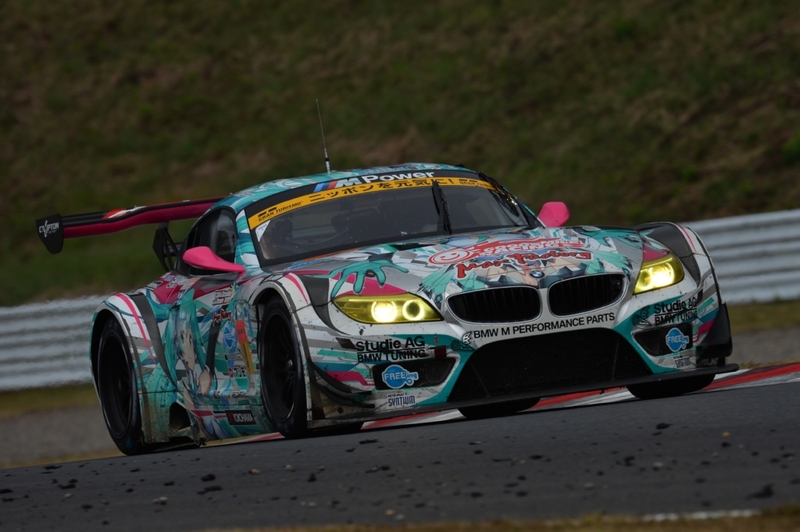 over the GSR HATSUNEMIKU BMW (Nobuteru Taniguchi) effectively in 2nd position. 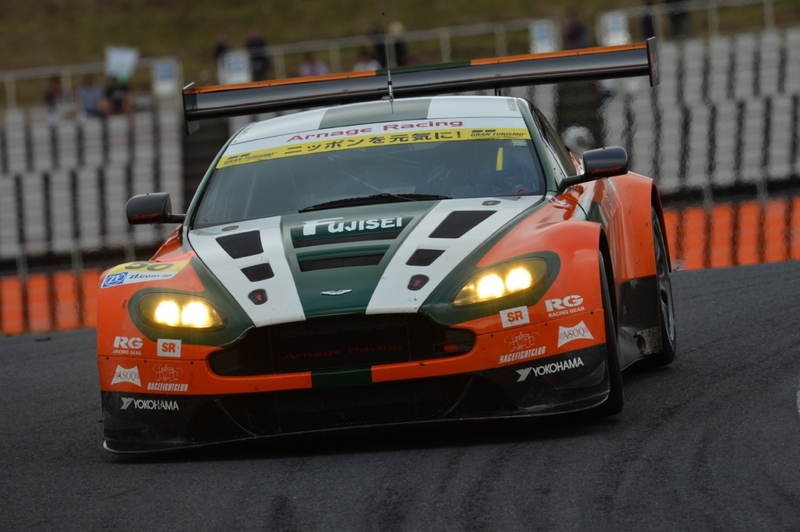 For the second stint, Masaki Kanou took the wheel of the Aston Martin and returned to the track with the lead in tact. Light rain had started to fall just before this point, making the track rather slippery. By now, however, the GSR HATSUNEMIKU BMW was chasing the Exe Aston Martin just three seconds behind it. Then, on the first turn of lap 44, Taniguchi in the GSR HATSUNEMIKU BMW managed to slip past the Aston Martin and take the lead. 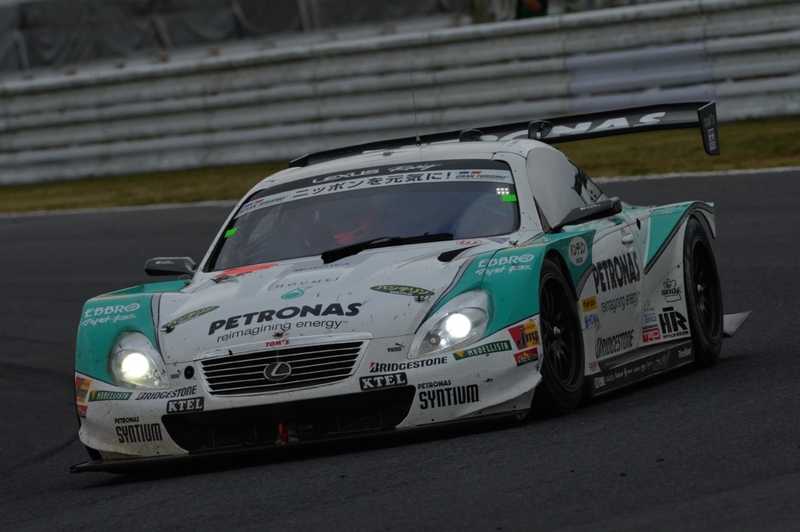 Once in the lead, Taniguchi was able to handle the slightly slippery track skillfully and pull away at a pace nearly a full second faster than the following pack. 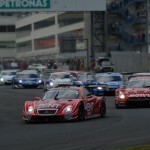 As for the trailing pack, there were hard battles going on as the teams vied to get as many series points as possible. The No. 61 SUBARU BRZ R&D SPORT (Tetsuya Yamano > Kota Sasaki) that had started the race from the pit and the No. 16 MUGEN CR-Z GT (Hideki Mutoh > Yuhki Nakayama) and No. 55 ARTA CR-Z GT (Shinichi Takagi > Takashi Kobayashi) that had qualified near the back of the class were now engaged in battles for 9th and 10th places, separated only by about one second and trading positions a number of times. Since all three of these machines were among the ranking leaders with a shot at the season title, they were desperate to get every point they could. With so much at stake, the competition between them was fierce. Also, the No. 11 GAINER DIXEL SLS (Bjorn Wirdheim > Katsuyuki Hiranaka) that had stood 2nd in the ranking coming into this race seemed to be struggling with tires that didn't fit the track conditions and had fallen from 3rd position back to below 10th position. The pit stop provided a chance to change to better tires and begin fighting back into the points. Meanwhile, the leading GSR HATSUNEMIKU BMW was able to hold a fast pace all the way to the checkered and claim its second consecutive win of the series, having built up a big lead of more than 30 seconds over the Exe Aston Martin in 2nd place (amounting to a lap behind due to the timing of the finish). Finishing 3rd came the veteran pair in the No. 52 OKINAWA-IMP SLS (Hironori Takeuchi > Takeshi Tsuchiya) that had worked up steadily from a 10th-position start. 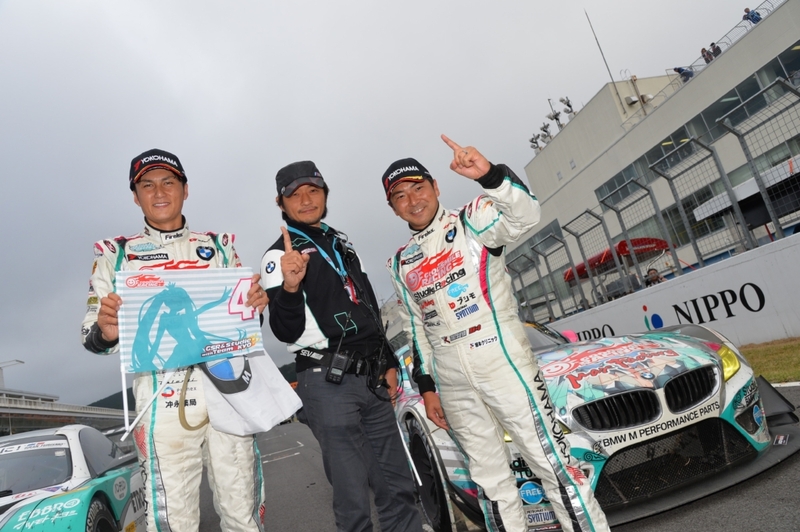 With its consecutive victories, the GSR HATSUNEMIKU BMW pair of Taniguchi and Kataoka rose to 2nd position in the standings, and will go into the final race of the series trailing the leader by eight points. In the battle for the last points, the MUGEN CR-Z GT pair of Mutoh and Nakayama finished 8th to secure two points and increase their lead at the top of the point standings. 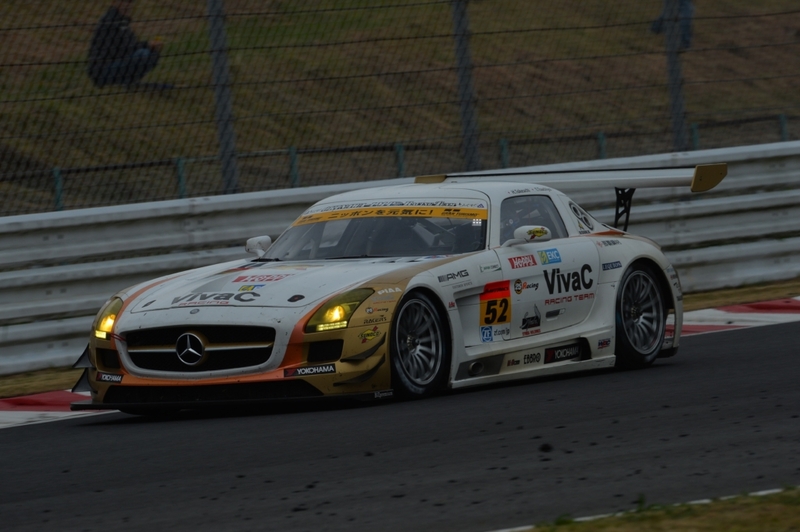 Third place in this race went to the OKINAWA-IMP SLS, raising it to 4th in the season ranking. By fighting in the last lap to finish 4th and 7th respectively, the GAINER DIXEL SLS pair of Hiranaka and Wirdheim and the No. 61 SUBARU BRZ R&D SPORT became the last of the five cars that will have a shot at the title in the final race of the series.